~Jo's Scrap Shack~: Happy Valentine's Day~ JAS Anything Goes! Happy Valentine's Day~ JAS Anything Goes! Happy Heart Day my friends!!! Today is a day full of love, chocolates and roses or as some would say, Valentines! It is also a day for another fun challenge with Just A Scrappin'. Today's challenge is Anything Goes BUT you cannot use the color RED. No problem right? So here is what I came up with without using any red. 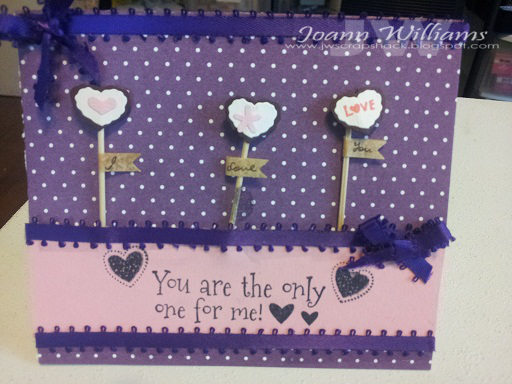 Well I sure hope you all have a wonderful Valentine's Day and if you are like me and are staying in, maybe you can try out the challenge and link up your own creation. Just stop on by the JAS Blog to see all the wonderful inspiration going on and to see what my other design team sisters created. I love how this came out. Very pretty. Awwww, great take on this week's challenge. I love it. This is really cute!! 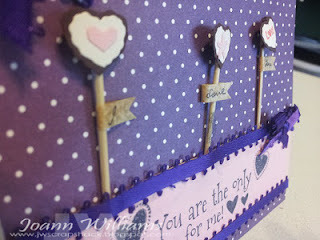 I agree... one layer cards are hard to do, but yours is great!! Love the purple! This card is very pretty!